I get it. January and February are b-o-r-i-n-g! The Christmas tree has come down, the fresh wreath is now tossed, and the poinsettias are dropping leaves every day. And when you look out the windows, there’s nothing much to see—unless you like dim gray winter skies. But there are some ways to brighten up your post-Christmas house! Try some colorful houseplants. Crotons have gorgeous leaves in pink/red/orange/yellow. The only catch is—they need some sun to keep those eye-popping colors. If you’re like me and actually get some nice winter sun once the trees lose their leaves, then go for it. Of course, I have to put mine outside for the summer, once the trees leaf back out, but that’s okay. Just let them dry out partly (but not completely) between waterings. There are some beautiful cacti with grafted tops in red/pink/yellow. They’re bright and cheerful and easy—needing only a sunny windowsill. There are also succulents growing in pretty rosettes of blue/silver-gray, even purple. Again, they need only a sunny window (and a light hand on the watering can). Bromeliads, believe it or not, are relatives of the pineapple and Spanish moss! However, there are table-top specimens with brilliantly colored inflorescences in hot pink, bright red, yellow or orange. The colorful spikes will often last two months or longer. A little trick to keep them looking their best, allow the soil to dry fairly well (just not bone-dry) but always keep a tablespoon or two of water in the middle of the plant. Both of these easy-care houseplants are a bright chartreuse-y green that will brighten up any area. 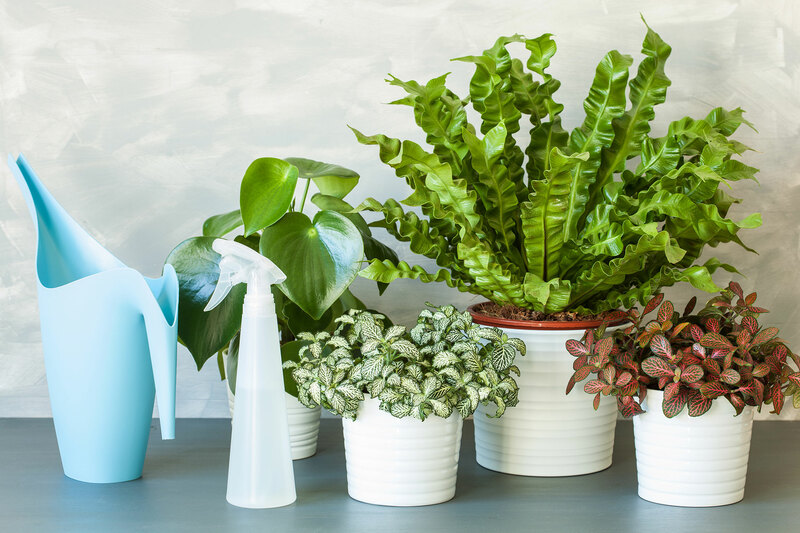 Like with most low-to-moderate light indoor plants, be sure not to over-water these. Allow the soil to go almost, but not quite, completely dry between waterings. Phals are among the easiest orchids to grow—needing just a couple of hours of early morning or later afternoon sun. The trick to keeping these happy is a light squirt from a mister bottle in the morning and being careful to water enough—without over-watering. And, no, don’t use ice cubes on a plant that’s native to near the equator! Of course, in my opinion, any new plant I bring home brightens up any room. But if you want eye-popping color, these five are a good start. Come in and let us help you find something to brighten up those winter blahs.